At the end of a long work week, you might be ready for a few laughs to help you relax. One thing millions of Chinese are enjoying these days is a series of online cartoons called One Hundred Thousand Bad Jokes. The first episode came to people's sight one year ago testing whether the audience would be interested its particular brand of humor. To the surprise of everyone involved, it gained over 37,000 reposts on Weibo, and broke 1 million views online. And the cartoons' popularity seems not to decline outside the nation. When someone uploaded it on Youtube with Vietnamese subtitles, it attracted 399,558 views from computers with Southeast Asian IPs in only three days. With 11 episodes at only around five minutes each, One Hundred Thousand Bad Jokes is gaining high exposure and international popularity. The animation is based on a comic series first published in 2009 on the comics sharing website u17.com. The stories take characters from old Chinese cartoons and Western fairy tales, including Seven Brothers of Calabash, Snow White and Pinocchio, then set them into stories suitable to today's young audience. The author of the comic series, Hanwu, shows bravery and audacity in creating his original stories under the indulgence of his commissioning editor. For example, he used blank pages to tell the whole story of the sixth Calabash brother who is invisible, and he gave an anti-social Pinocchio a "happily ever after" ending with Snow White as his girlfriend, thanks to his unique talent. With a lot of wordplay and adult humor, this cartoon series entertains a wider audience than many other cartoons that target teenagers. "We were planning to catch the eye of millions of ACG (animation, comics and games) fans, but it has far exceeded our original goal," said Dong Zhiling, the co-founder of u17.com. 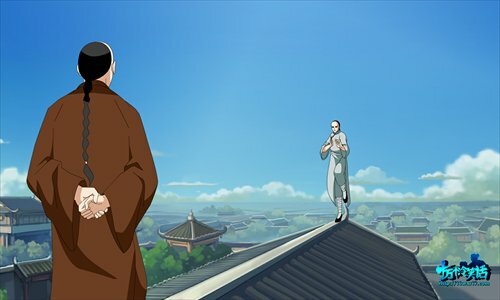 Many netizens have written their comments in support of the animation series. One named Buguo wrote, "There are key elements that repeat in every chapter with some sexually suggestive content. It merges contemporary fashion elements with scenes we are familiar with from our childhood... [What makes it so funny is how] the personalities of the characters break with the original images in our mind." The part-time cartoonist Hanwu does not spend too much time on creation. In an e-mail sent to the Global Times, he admitted that he felt great pressure after his work became so popular. "I composed the story just for fun at the very beginning, and my small group of readers read it for fun. But now I get criticized if I don't draw it perfectly or make people laugh, because now it's getting so much attention," he wrote. Hanwu named the series One Hundred Thousand Bad Jokes, and said he's not afraid of running out of material. But when asked if he truly plans to create 100,000, he answered humbly, "It depends." One Hundred Thousand Bad Jokes has raised 1.24 million yuan ($202,000) for its upcoming movie version and has over 5,000 supporters or "micro-investors," as they are called on the crowd funding website demohour.com. The first micro-investor donated 100,000 yuan ($16,310). Listed as "Guoguo's father" on the website, he presented his reasons for supporting the project: "I want to attend the premiere of the animated movie with my daughter in Beijing" and "From now on I can tell others that I am also a movie producer." When talking about the success of crowd funding, Dong said, "One of our reasons to do it is to show that even though most people are watching our cartoons now for free, our audience is also willing to support us with funds, which boosts our investors' confidence on our movie's box-office potential. Also, we are so glad to have so many people participating in our project." Dong said he wanted to make the movie version like a long version of the current series but with new themes. "But the fixed characters will stay in the story." Instead of traditional ways of broadcasting on TV channels, the cartoon series can only be found on video sharing websites including Youku, Iqiyi and bilibili.com, but so far, none of them are cooperating with the producer by purchasing the copyright. "The online video market has not been monopolized by any one company, so it is better for us to use all the platforms to spread our work more widely," Dong told the Global Times. "The main revenue for the animated version comes from advertisements that pop into view, and from the sharing bonus paid by the video sharing websites," he added. Inserting advertisement is a common way seen in Western cartoons, but it might be the first time for Chinese audiences to see the advertisements so obviously in an animated work. Hanwu said the pop-up advertisements are his only dissatisfaction with the animation. However, as Zhou Jingqi, the administrator of u17.com, says during the end credits of the last episode of One Hundred Thousand Bad Jokes, "How could we let you watch our animation for free if we were not selling ourselves?" Dong told the Global Times that they learned a great deal from the case of One Hundred Thousand Bad Jokes. "We produce the animation for popular comics, and then set up a movie version for the widely praised ones," said Dong, "This operating method is already very mature in some countries, but has not been practiced successfully in China. And we are trying to find a proper way to promote the whole ACG industrial chain [domestically]." As many traditional modes of importing ACG works are not quite suitable for the Chinese market, Dong regards the e-reading era as a key to a new start. "We can develop some new ways by adapting e-readers' habits and tastes." Dong hopes to accomplish that goal by offering plenty of functions that enrich viewers' reading experience. One of the unique functions of u17.com is that users can type in their comments and paste them wherever they want to show on the comic so that later viewers can read the previous comments. The first page of One Hundred Thousand Bad Jokes contained nearly 5,000 comments. And coming soon will be a new dubbing button to allow some of the readers of comics to perform as voice actors.